One of the most important considerations in determining what garden and landscape plants you can grow in your garden is whether or not they will survive in the planting zone for your area. The USDA Planting Zone Map factors in average winter minimum temperatures. This collection of information starts with Zone 1, where minimum temperatures can go down to MINUS 50° F., and ranges to Zone 11, for the lucky gardeners in Hawaii and extreme Southern Florida where lows don't drop below 40° F.
The information provided is based on data collected by the USDA over a period of 70 years. We chose to utilize the USDA standard planting zones rather than other zone standards because of its more universal use by both gardeners and growers. 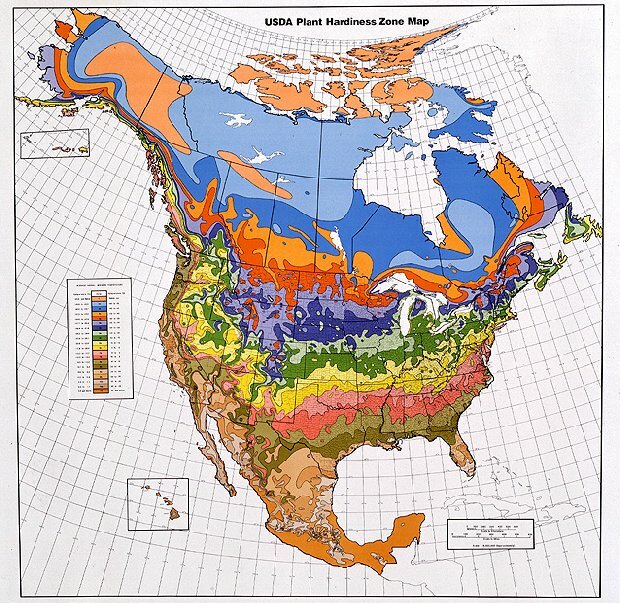 This Plant Growing Zones Atlas consists of the master map, nine regional maps, a "last frost date" map, tables and charts. Use them as tools to plan your gardening activities. Keep in mind that there is always a chance of occasional extreme winters or summers that should also be factored into your plans! Special thanks to Jody Shuart, Scott Bauer and the ARS Information Staff for their hard work on the Plant Hardiness Zone Map project!